When a man takes a plunge into the sea, he gets the merit of bathing in all the Tirthas and sacred rivers. Similarly when a man takes refuge at the feet of the Sad-guru, he gets the merit of bowing to the Trinity, i.e. Brahma, Vishnu and Mahesh and also Para-Brahma. Victory be unto Shri Sai the wish-fulfilling tree and the ocean of knolwedge, who gives us self-realisation. Oh Sai, create in us regard for Your stories. Let the readers and audience devour them with the same relish with which the chatak bird drinks the water from the clouds and becomes happy. While listening to Your stories, let them and their families get all the sattwik emotions, viz. let their bodies perspire, let their eyes be full of tears, let their prana be steady, let their minds be composed, let their hair stand on end, let them cry, sob and shake, let their hostilities and their distinctions, great and small vanish. If these things happen, that is a sign of the grace of the Guru dawning upon them. When these emotions develop in you, the Guru is most pleased and will certainly lead you on to the goal of self-realisation. 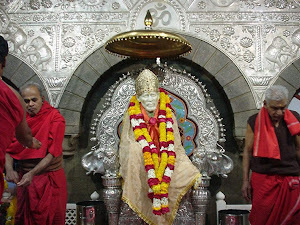 The best way, therefore, to get free from the shackles of Maya is our complete and whole-hearted surrender to Sai Baba. The Vedas cannot take you across the ocean of Maya. It is only the Sad-guru, who can do so and make you, see the Lord in all creatures. 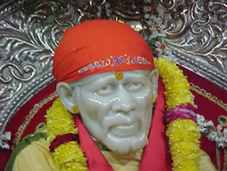 The variety of imparting instructions followed by Sai Baba has already been noticed in the previous Chapters. In this, we shall deal with one aspect of it. It was the habit of some devotees to take some religious books, of which they wanted to make a special study, to Sai Baba and to receive the same back from Him, after they were touched and consecrated by Him. While reading daily such books, they felt that Sai Baba was with them. 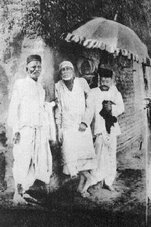 Once, Kaka Mahajani came to Shirdi with a copy of Ekanathi Bhagwat. Shama took that book to read and taking it with him went to the Masjid. There Sai Baba took it from him, touched it and turning some pages here and there gave it back to Shama and asked him to keep it with him. When Shama said that it belonged to Kaka and had to be returned to him. "No, no", said Sai Baba. "As I have given it to you, better keep it with you for safe custody; it will be of use to you." In this way many books were entrusted to Shama. Kaka Mahajani after a some days came again with another copy of the same Bhagwat and gave it in Sai Baba's hand. Then Sai Baba gave it back as Prasad and asked him to preserve it well and assured him that it would stand him in good stead. Kaka accepted it with a bow. Shama was a very intimate devotee of Sai Baba and Sai Baba wanted to favour him in a particular way by giving him a copy of Vishnu-Sahasra-Nam as Prasad. This was done in the following way. 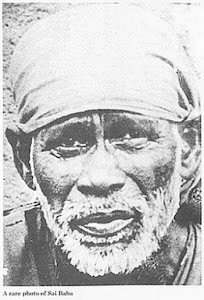 Once a Ramadasi (follower of Saint Ramadas) came to Shirdi and stayed for some time. The routine he followed daily was as follows : He got up early in the morning, washed his face, bathed and then after wearing saffron-coloured clothes and besmearing himself with sacred ashes, read Vishnu-Sahasra-Nam (a book giving a thousand names in praise of Vishnu, and held second in importance to Bhagwad Geeta) and Adhyatma-Ramayana (Esoteric version of Rama's story) with faith. He read these books often and often and then after some days Sai Baba thought of favouring and initiating Shama with Vishnu-Sahasra-Nam. He, therefore, called the Ramadasi to Him and said to him that, He was suffering from intense stomach-pain, and unless He took Senna-pods (Sona-mukhi, a mild purgative drug) the pain would not stop; so he should please go to the bazar and bring the drug. The Ramadasi closed his reading and went to the bazar. Then Sai Baba descended from His seat, came to the Ramadasi's place of reading, took out the copy of Vishnu-Sahasra-Nam, and coming to His seat said to Shama- "Oh Shama, this book is very valuable and efficacious, so I present it to you, you read it. Once I suffered intensely and My heart began to palpitate and My life was in danger. At that critical time, I hugged this book to My heart and then, Shama, what a relief it gave me! I thought that Allah Himself came down and saved Me. So I give this to you, read it slowly, little by little, read daily one name at least and it will do you good." Shama replied that he did not want it, and that the owner of it, the Ramadasi who was a mad, obstinate and irritable fellow would certainly pick up a quarrel with him, besides, being a rustic himself, he could not read distinctly the Sanskrit (Devanagari) letters of the book. Shama thought that Sai Baba wanted to set him up against the Ramadasi by this act of His, but he had no idea of what Sai Baba felt for him. Sai Baba must have thought to tie this necklace of Vishu-Sahasra-Nam round the neck of Shama, as he was an intimate devotee, though a rustic, and thus save him from the miseries of the worldly existence. The efficacy of God's Name is well-known. It saves us from all sins and bad tendencies, frees us from the cycle of births and deaths. There is no easier sadhana than this. It is the best purifier of our mind. It requires no paraphernalia and no restrictions. It is so easy and so effective. 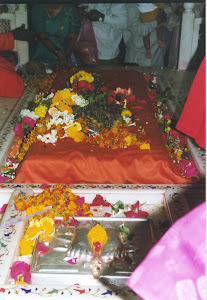 This sadhana, Sai Baba wanted Shama to practise, though he did not crave for it. So Sai Baba forced this on him. It is also reported that long ago, Eknath Maharaj, similarly, forced this Vishnu-Sahasra-Nam on a poor Brahmin neighbour, and thus saved him. The reading and study of this Vishnu-Sahasra-Nam is a broad open way of purifying the mind, and hence Sai Baba thrust this on His Shama. The Ramadasi returned soon with the Seena-pods. Anna Chinchanikar, who was then present and who wanted to play the part of Narada (the Celestial Rishi who was well-known for setting up quarrels between Gods and demons and vice versa), informed him of what had happened. The Ramadasi at once flared up. He came down at once on Shama with all fury. He said that it was Shama who set Sai Baba to send him away under the pretext of stomach-ache for bringing the medicine and thus got the book. He began to scold and abuse Shama and remarked that if the book be not returned, he would dash his head before him. Shama calmly remonstrated with him, but in vain. Then Sai Baba spoke kindly to him as follows - "Oh Ramadasi, what is the matter with you? Why are you so turbulent? Is not Shama our boy? Why do you scold him unnecessarily. How is it that you are so quarrelsome? Can you not speak soft and sweet words? You read daily these sacred books and still your mind is impure and your passions uncontrolled. What sort of a Ramadasi you are! You ought to be indifferent to all things. Is it not strange that you should covet this book so strongly? A true Ramadasi should have no 'mamata' (attachment) but have 'samata' (equality) towards all. You are now quarrelling with the boy Shama for a mere book. Go, take your seat, books can be had in plenty for money, but not men; think well and be considerate. What worth is your book? Shama had no concern with it. I took it up Myself and gave it to him. You know it by heart. I thought Shama might read it and profit thereby, and so I gave to it him." How sweet were these words of Sai Baba, soft, tender and nectar-like! Their effect was wonderful. The Ramadasi calmed down and said to Shama that he would take 'Panch-ratni' Geeta in return. Shama was much pleased and said - "Why one, I shall give ten copies in return". So the matter was ultimately compromised. The question for consideration is "Why should the Ramadasi press for Pancha-ratni Geeta, the God in which he never cared to know, and why should he, who daily read religious books in the Masjid in front of Sai Baba, quarrel with Shama before Him?" We do not know how to apportion the blame and whom to blame. We only say that, had this procedure been not gone through, the importance of the subject, the efficacy of God's name and the study of Vishnu-Sahasra-Nam would not have been brought home to Shama. So we see that Sai Baba's method, of teaching and initiating was unique. In this cases Shama did gradually study the book and mastered its contents to such an extent, that he was able to explain it to Professor G.G. Narke, M.A. of the College of Engineering, Poona, the son-in-law of Shriman Booty and a devotee of Sai Baba. One day, while Kakasaheb Dixit was in mediation after his morning bath in his Wada at Shirdi he saw a vision of Vitthal. 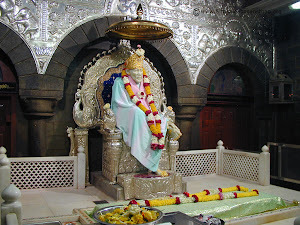 When he went to see Sai Baba afterwards, Sai Baba asked him - "Did vitthal Patil come? did you not see Him? He is very elusive, hold Him fast, otherwise He will give you the slip and run away". Then at noon a certain hawker came there, with 20 or 25 pictures of Vitthal of Pandharpur for sale. Mr. Dixit was surprised to see that the form of Vithal he saw in his mediation exactly tallied with that in the picture and he was also reminded of Sai Baba's words. He therefore, bought one picture most willingly and kept it in his shrine for worship. Sai Baba always loved those who studied Brahma-vidya (metaphysics) and encouraged them. To give an instance - Once Bapusaheb Jog received a post-parcel. It contained a copy of Geeta-Rahasya by Lokamanya Tilak. Taking it under his armpit he came to the Masjid and prostrated himself before Sai Baba, when the parcel fell at Sai Baba's Feet. Sai Baba enquired what it was. 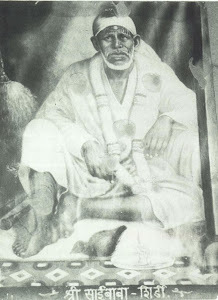 It was opened then and there and the book was placed in Sai Baba's hand. He turned some pages here and there for a few minutes and took out a rupee from His pocket placed it on the book and handed the same with the rupee to Jog and said to him - "Read this completely and you will be benefited". Let us close this Chapter with a description of the Khapardes. 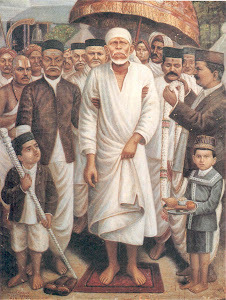 Once Dadasaheb Khaparde came with his family and lived in Shirdi for some months. 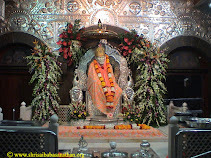 (The diary of his stay has been published in English in the Shri Sai Leela Magazine first Volume.) Dadasaheb was not an ordinary man. He was the richest and the most famous advocate of Amraoti (Berar) and was a member of the Council of State, Delhi. He was very intelligent and a very good speaker. Still he dared not open his mouth before Sai Baba. Most devotees spoke and argued with Sai Baba off and on, but only three, viz. Khaparde, Noolkar and Booty kept always silent. They were meek, modest, humble and goodnatured. 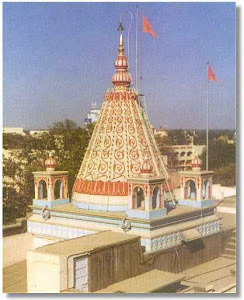 Dadasaheb, who was able to expound Panchadashi (A well-known Sanskrit treatise on the Adwaita Philosophy by the famous Vidyaranya) to others, said nothing or uttered no word when he came to the Masjid before Sai Baba. Really a man, however learned he may be even in Vedas, fades away before one, who was realised Brahman and become one with it. Learning cannot shine before Self-reaisation. Dadasaheb stayed for four months, but Mrs. Khaparde stayed for seven. Both were highly pleased with their Shirdi stay. Mrs. Khaparde was faithful and devout, and loved Sai Baba deeply. Every noon she brought naivedya herself to the Masjid, and after it was accepted by Sai Baba, she used to return and take her meals. Seeing her steady and firm devotion, Sai Baba wanted to exhibit it to others. One noon she brought a dish containing Sanza (wheat-pudding), purees, rice, soup, and kheer (sweet rice) and other sundry articles to the Masjid. Sai Baba, who usually waited for hours, got up at once, went up to His dining seat and removing the outer covering from the dish began to partake of the things zealously. Shama then asked Him - "Why this partiality? You throw away dishes of others and do not care to look at them, but this You draw to You earnestly and do justice to it. Why is the dish of this woman so sweet? This is a problem to us." Sai Baba then explained - "This food is really extra-ordinary. In former birth this lady was a merchant's fat cow yielding much milk. Then she disappeared and took birth in a gardener's family, then in a Kshatriya family, and married a merchant. Then she was born in a Brahmin family. I saw her after a very long time, let Me take some sweet morsels of love from her dish." Saying this, Sai Baba did full justice to her dish, washed his mouth and hands, gave out some belches as a mark of satisfaction, and resumed His seat. Then she make a bow and began to shampoo Sai Baba's legs and Sai Baba began to talk with her and knead her arms which were shampooing His Legs. On seeing this reciprocal service Shama began to joke and said - "It is going on well, it is a wonderful sight to see God and His Bhakta serving each other. "After being pleased with her sincere service, Sai Baba asked her in low and fascinating tone to chant 'Rajarama, Rajarama' then and always, and said - "If you do this, your life's object will be gained, your mind will attain peace and you will be immensely benefited." To persons unfamiliar with spiritual matters, this might appear as affair, but really it was not so. It was a case of, what in technically called, 'Shakti-pat', i.e. transference of power from the Guru to the disciple. How forcible and effective were Sai Baba's words! In an instant, they pierced her heart and found lodgement there. Love, Grace, Protection and Blessings of Sadguru SaiBaba be on All !!! Do You remeber Me while doing your chores? I feel always anxiety for My men. He who does anything (spiritual endeavour) will reap its fruit and he who remembers these words of Mine will get invaluable happiness." My Sircar says "Take, take," but everybody comes to me and says 'Give, give.' Nobody attends carefully to the meaning of what I say. My Sircar's treasury (spiritual wealth) is full, it is overflowing. I say, "Dig out and take away this wealth in cartloads, the blessed son of a true mother should fill himself with this wealth. Our Karma is the cause of our happiness and sorrow; therefore put up with whatever comes to you. Allah (God) is the sole Dispenser and Protector, always think of Him. He will take care of you. Surrender to His feet with body, mind, wealth and speech, i.e. completely and then see what He does." "He who carps and cavils at others, pierces Me in the heart and injures Me, but he that suffers and endures, pleases Me most." God Will do good !!! When you hurt anybody know that you are hurting Me !!! While meditating on him my mind and intellect were stunned and I had thus to keep quiet and bow to him in silence. Neither I am God nor Lord. I am His obedient servant and remember Him often. He, who casts aside his egoism, thanks Him and he, who trusts Him entirely, will have his shackles removed and will obtain liberation. I only ask and take from him whom the Fakir (My Guru) points out. If any one is indebted formerly to the Fakir money is received from him. The donor gives, i.e. sows his seeds, only to reap a rich harvest in future. Wealth should be the means to work out Dharma. If it is used for personal enjoyment, it is wasted. Mere questioning is not enough. The question must not be made with any improper motive or attitude or to trap the Guru and catch at mistakes in the answer, or out of idle curiosity. It must be serious and with a view to achieve moksha or spiritual progress. Seva is not rendering service, retaining still the feeling that one is free to offer or refuse service. One must feel that he is not the master of the body, that the body is Guru's and exists merely to render service to him. It is not enough merely to prostrate before the Jnanis. We must make Sarvaswa Sharangati (complete surrender) to the Sad-guru. "Build the Wada with the temple. I shall fulfill the desires of all. "after the temple is complete I will come there to stay" and staring at the Wada He added - "after the Wada is complete, we shall use it ourselves, we shall live, move and play there, embrace each other, and be very happy."